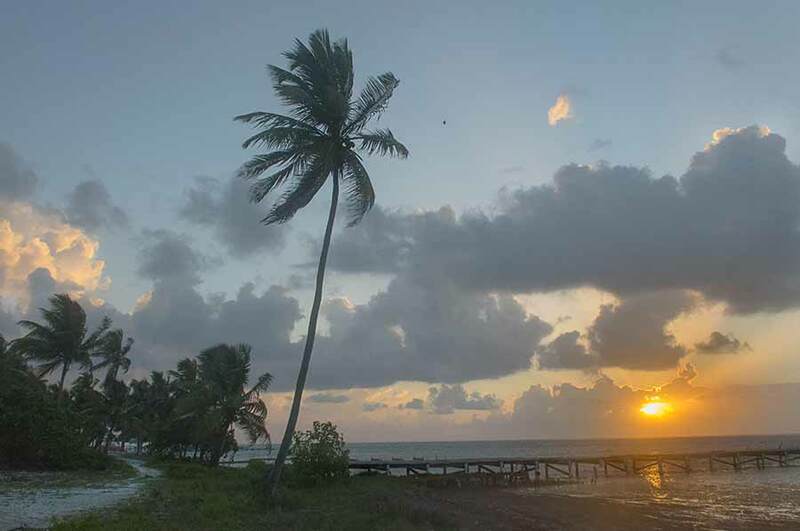 Belize NMS: Warm and generally fair weather prevails. 24-hour forecast: Sunny with cloudy spells today and partly cloudy skies tonight. Showers or thunderstorms will be isolated, but slightly more will affect inland and southern areas this afternoon. General Outlook: For Sunday and Sunday night is for a similar trend to occur. Tonight E 10-20 kts Choppy-Moderate 3-5 ft SAME AS TODAY. Tomorrow E 5-15` kts Choppy 3-5 ft SAME AS TODAY. An upper-level trough extends over the Yucatan Channel and the northwest Caribbean. Upper-level diffluence on the eastern side of this trough is supporting numerous showers and scattered moderate convection N of 13N between 74W and 84W. 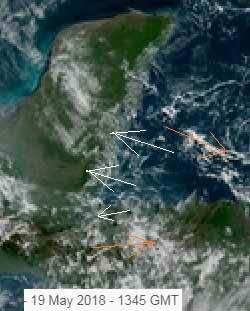 The interaction of the upper trough with the nearby E Pacific monsoon trough over Panama is supporting clusters of moderate to strong convection S of 13N between 76W and 83W. Broad high pressure over the subtropical Atlantic continues to support moderate to fresh tradewinds over the NW and E Caribbean, and fresh to strong winds over the central Caribbean. Light winds are occurring over the extreme SW Caribbean near the eastern Pacific monsoon trough. Wave heights of 8 to 10 ft continue to occur over the S central Caribbean as confirmed by a recent satellite altimeter pass and current buoy data. Over the next couple of days, the upper-level trough will remain in place enhancing shower and thunderstorm activity over the western Caribbean. The surface ridging pattern over the Atlantic will persist, keeping a similar wind profile in place across the basin into early next week. On Ambergris Caye this morning the wind is blowing from the East at 10 mph making the sea around our barrier reef choppy. The sky is clear and today's expected high is 88 f.
The weather has ot back to a fairly stable, typical condition. 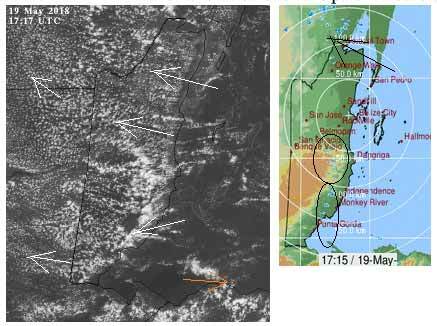 Caribbean winds with some cloud coming in from the ESE, causing lines of white puffy clouds over land. The only high level clash is way out at sea. Looks like today will be generally sunny, with white clouds building and reducing this afternoon, no indication of rain at present. Cooler than earlier this week. The Cloud & rain picture. 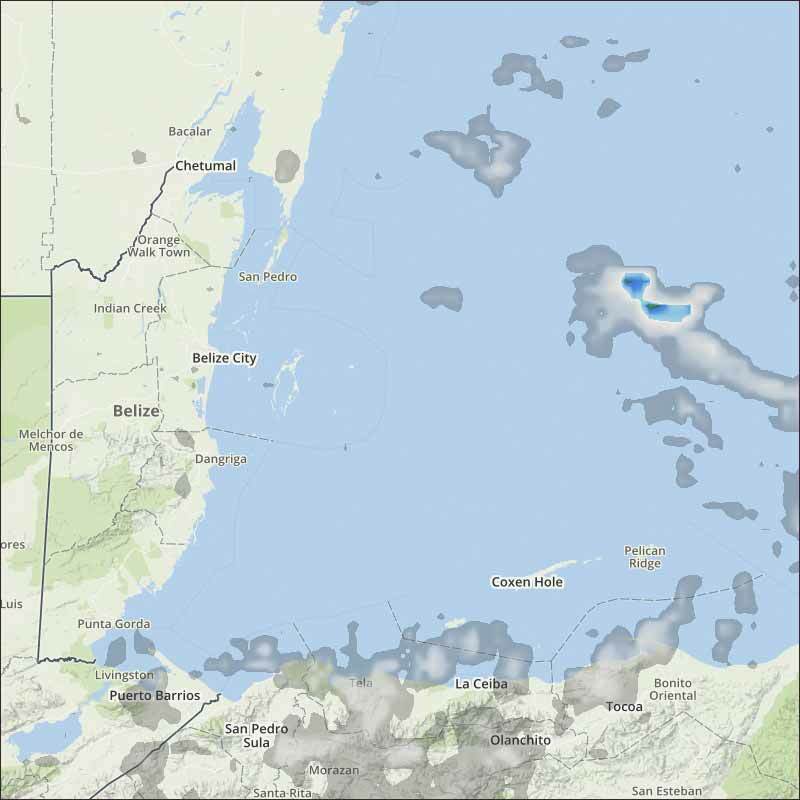 There has been a line of cloud build up against the mountains, causing a little rain in parts of central and southern Belize, a little clash rain up in Mexico and Corozal. It's taken a few hours for this patern to develop.